Sale may be subject to term & conditions of an offering plan. New EIK, re-done bathroom, Hardwood floors, Elevator building. Large 1 bedroom. 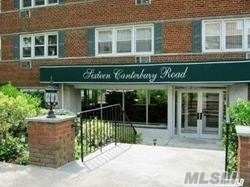 This desirable building is close to the LIRR and town. Maintenance with a basic star exemption is 798.42 which includes heat, water and the real estate taxes.